Ask a volunteer to guess your PIN by naming any four-digit number and then prove beyond a doubt they got it right. 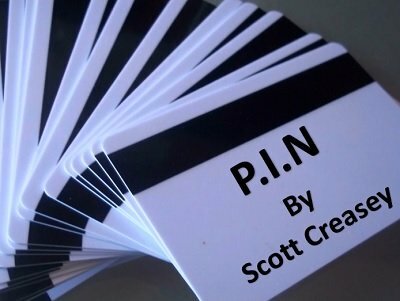 In this 20 min video Scott shares the routine and handling he has been using for years in order to enable a volunteer to guess the PIN for his American Express Card, Visa Card, or any other card. If you prefer, you can of course have them guess the PIN for your phone. A low-tech no nonsense, no electronics, non-magnetic and App free approach to a PIN number revelation, using business cards and a pen. Set up in seconds, resets in seconds and great for table hopping.